California drama aside, the overall 2013 wildfire season isn't likely to go down in the history books. In terms of overall acreage burned, for example, last summer was way worse. We might want to consider ourselves lucky for now, because according to Harvard researchers, wildfire season will last longer and burn a wider area by 2050. Their study, which will be published in the journal Atmospheric Environment, is based on "a set of internationally recognized climate scenarios, decades of historical meteorological data, and records of past fire activity." 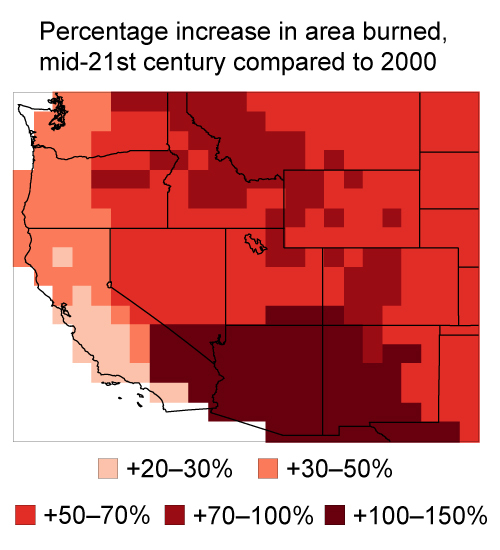 Compared to present-day conditions, they found, the area burned in the Pacific Northwest could increase by 65 percent during the mid-century Augusts. In the Eastern Rocky Mountains/Great Plains regions, it could nearly double, and in the Rocky Mountains forest, it could quadruple. Fire season would start earlier, in late April instead of mid-May, and extend to mid-October. Furthermore, the probability of large fires could double or even triple. As things get smokier, they say, air quality will suffer as a result. As we saw with the Rim Fire, a number of factors can come together to make things worse. The researchers' reasons for expecting bigger fires vary by region, but across the U.S., most of the blame can be attributed to the warming planet.